This Kettle from Rachel Ray is the bigger of the 2 presented here with a total capacity of 2 quarts. It also has an easy to clean beautiful and smooth porcelain exterior that comes in apple green. The curved handle adds to its beauty while ensuring that its cool touch material always remains neutral to the hot kettle body. You also get a metallic whistle when the water reaches boiling point. Rachel Ray teapots and tea kettles have quickly risen to being the most coveted thanks to not only being durable and highly functional but also for the extensive attention to beauty and design. There are plenty of teapots and kettles from Rachel Ray that will be impressive in your kitchen but the following selections truly lead the pack. 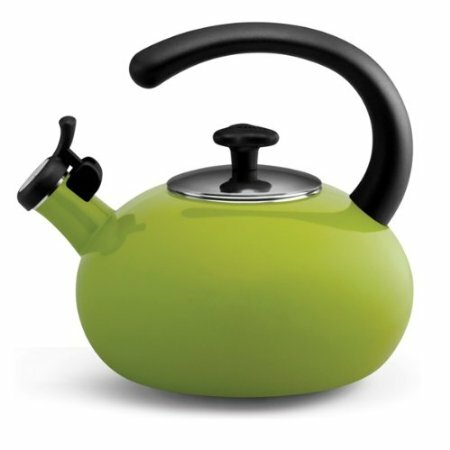 All the Rachel Ray teapots & kettles will be great additions to your tea brewing rituals. The above two however definitely take the crown. Whether you are looking to buy an electric kettle or a teapot, whether you want to compare various brands or even when you want to see which model from one specific manufacturer is the best, the TheTeaSupply.com reviews will get you to the most viable conclusions. Check out all the tea product reviews from the TheTeaSupply.com!